Wrong answer! (In a lot cases, anyway). I work with a lot of startups and I hear the above all too often, especially when the founder or CEO comes from a technical background. But this attitude is often very unfortunate and in some cases can stunt or kill a company that should have otherwise made done very well. That’s because there is low-hanging fruit outside of your home markets, my friends. And if you leave it out there long enough, your competitors will grab it instead of you. I’ve sold an incredible amount of software in secondary markets such as Australia, New Zealand, Norway, Denmark, Finland, Sweden, Switzerland, Netherlands, Belgium and others. As one example in the early 90s, I started up a group marketing a new Systems Management product. By the middle of our second year of operation, over 40% of our revenue was international, all while spending just a fraction of our marketing budget outside of the US. In recent years I’ve worked as a consultant with a large number of software-based businesses, most of which were not giving international markets much attention prior to my involvement. In almost every instance we were able to make a material impact on the business with minimal investments. US-based early stage software companies can access this low-hanging fruit relatively easily for a number of reasons. First, in the software business there aren’t the risks and costs associated with inventory that you would find in a manufactured goods business. In fact if your business is SaaS-based, all supply chain issues goes away (with the exception of maybe putting your product on a few different servers worldwide to limit latency issues). In a software-based business (vs. physical goods such as electronics) the costs and risks of international expansion are still there, but they are greatly reduced to such an extent they aren’t really a strategic issue. Next, most of your early stage software competitors have the attitude outlined the first paragraph of this article and are contentedly pounding away at their home markets. Next, it is far easier to adjust prices to local markets and set up segmentation fences through localization in the software business, than it is in a hardware business. In addition, if you are a US-based company, there will be some symbiotic overflow effect from your US marketing efforts, since the US is the center of the software world. And last (but definitely not least) is the unique attribute of secondary markets: the ability to find really good distribution Partners. Now you might say “Why recruit partners and give them part of the cut if I can do it myself these days? Especially if my product is SaaS-based? Because these partners will have a large head start on you (and your competitors) in their markets, providing existing momentum, brand recognition a customer base and resources that you can leverage to maximize your penetration quickly. And make no mistake–while you can market and sell worldwide via the Internet these days (and should! ), local folks on the ground in remote countries with intimate market knowledge and personal connections still give you an advantage. I don’t see that changing anytime soon. We’ll come back to this last point in a minute. But first, let’s go back to our mostly typical US-based software startup. However, this CEO is an exception and is rather bold compared to his peers. He decides he will dip the company’s toe into international markets. So where do they go first? Why, the UK, of course! It “feels” the most like home and Brits speak “somewhat” the same language as in the US. And indeed, it is the most similar market to the US in this way: The UK is usually the SECOND MOST COMPETITIVE and sophisticated market in the world! This makes it difficult to crack and especially to find the type of partners you’d like to have in international software distribution markets, because the market is so developed that potential partners are almost strictly demand-fillers (much like in the US). To add to this misstep, although the UK is (for now, at least) officially part of Europe, from a cultural and marketing/distribution perspective, it is quite different; again often more closely resembling the US. So this step doesn’t even provide quite the initial learning experience you’d get when moving on to continental Europe. Let’s get back to that unique positive attribute of secondary international software distribution markets I mentioned earlier, the ability to find good partners. I’ve highlighted partners because it is so important to find the right partners and treat them well. What you are looking for is find someone who to the greatest extent possible will proactively ACT ON YOUR BEHALF in this local market. Someone who will put out the effort, spend their own capital, and be just as committed to the product’s success in this market as you are in your home market. This isn’t easy to do–but it’s much easier to obtain international software distribution in secondary markets than it is in the highly developed, larger markets — and the payoff is high if you get it right. Find the best potential partner, then structure the deal to get them excited. Give them high discounts, provide extensive sales and technical training. Give them at least a short term, informal exclusive in their territory. Set the deal up so that they aren’t competing with other distributors of your product or even you–just your common enemy, the competition. If you do this right, you often will have created an order/revenue generation machine that will work for you for years to come–with very little ongoing investment. This partner channel could hit the ground running and be humming along for a while, even while you’re still investing and pounding away while trying to get fully established in your own home market. This is contrary to what many will tell you; but I’ve found it to be true in many cases. I have personally done it many times across a variety of markets and products. I could write much more about this topic — it’s NOT simple. And of course, the devil is always in the details. But I’ll stop here. What have been your own experiences in international software distribution? Tell us what YOU think! Your points are all very relevant for the classic software distribution model. But many software companies are avoiding the distributor model. 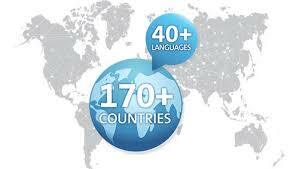 For a SaaS startup or an App, their first market is generally all English-speakers across the world. They keep the software simple, their costs low and they don’t need distributors. Until their software mature and they have complex enterprise versions, sales teams, product marketing, rich localization. When companies go in the other direction the dynamics change. For a UK company it is very difficult to establish a strong position. Our home market is full of US vendors! Non-English speaking countries have the advantage that they can grow their position at home. Treat that marketing as their testing ground and when they know they have a well established product-marketing fit then they can invest in expanding to the English-speaking world.